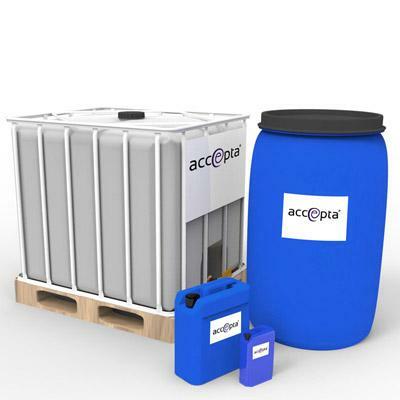 Accepta 2202 is a high performance, non-volatile cooling water scale and corrosion inhibitor scientifically formulated for the treatment and protection of open circuit evaporative cooling systems and air conditioning plant operating under hard water conditions. Accepta 2202 is a high specification cooling water treatment product developed to be used in conjunction with Accepta biocide treatments to efficiently control the type of bacteria considered to be a possible source of Legionella species. Accepta 2202 is a neutral blend of an organic corrosion inhibitor, a threshold deposit controller and sludge conditioner, offering protection to multi-metal systems without the requirement of additional specific corrosion inhibitors. A high performance multi-purpose HVAC chemical treatment product, Accepta 2202 is free from heavy metals and phosphates and offers superior protection over an extended range of pH, temperature and raw water hardness, making an ideal treatment for both building services and industrial applications. Accepta 2202 is the neutral version of Accepta 2312. To ensure rapid film formation and corrosion control the system should be pre-treated with Accepta 2312 for two or three weeks at twice the normal continuous dosage. Accepta 2202 should be dosed to maintain a minimum of 100ppm in recirculation. For maximum control and economy it should be dosed continuously, excellent results being achieved employing an automatic proportional dosing unit POA. NOTE – Accepta 2202 should NOT be used in conjunction with either chlorine or bromine.